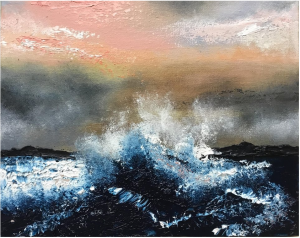 Jane’s work is best described as a series abstract landscapes and seascapes, in which she hopes to evoke the mood of a place rather than a realistic representation. She is inspired by her surroundings, both in Hampshire and Cornwall, to create both large (100x120cm) and small (30x25cm) works. She has been painting for the last ten years, both portraits and landscapes, in oils. She started her artistic career studying at Andover College, gaining a Foundation qualification as well as being nominated for the Artist of the Year at the final show, before continuing her studies at London’s Art Academy. She was runner up in their Philip Trousell Prize and the work acquired for their permanent collection. Since graduating she has exhibited in London, Hampshire and Cornwall in self-curated shows, as well as with Llewellyn Alexander in Waterloo and Bils & Rye in Yorkshire. She takes commissions for portraits and landscapes.